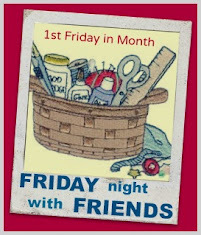 I love Friday nights where you get to stitch with ‘the girls’ and last night was no exception. and got all the applique done (not that there’s a lot on this project)…. So today is going to be sitting in front of the telly catching up on some pre-recorded TV programs I’ve missed and stitching! aaaaah….a perfect Saturday. Thanks to Cheryll for hosting another fine event….pop on over to see what everyone else got up to! Nice work Wendy, cute little sun too! Wonder what this is going to be! Can't wait to see. Looking good so far!